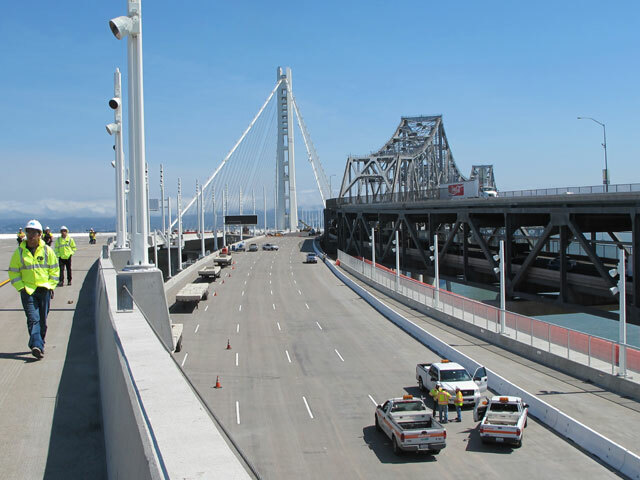 The new eastern span of the Bay Bridge has been open for three months. It's still shiny and novel enough that we don't quite take it for granted. Just this morning, the driver in my carpool was praising the nice wide shoulders on the roadway. But all the disquieting news that came spilling out last March when a crucial set of metal rods started to snap? When's the last time you thought about that? Even if most of us have put the broken rods out of our minds (along with later disclosures about problems with the specs for those components, the problems with their manufacture, and lack of testing), the Sacramento Bee's Charles Piller has not. He's documented a series of potentially major problems in the building of the $6.4 billion bridge, including questions about inspection of concrete in the span and carelessness in installation of the steel tendons that are supposed to lend strength to its long skyway section. Piller's latest story, published Saturday, focuses on continuing questions about whether the bridge officials' review of the broken rods was sound. (As a basic refresher: The issue arose when 32 massive threaded steel rods designed to anchor a seismic stability structure to the new span cracked soon after they were tightened. The rods' failure led to disclosures that the rods may have been manufactured out of steel that was too hard for the intended purpose, that the rods had been improperly galvanized, and that steel fasteners in other parts of the bridge might also be vulnerable. In response, bridge officials started a new testing program and inspection of rods and bolts throughout the bridge, and generally gave them a clean bill of health). Piller's new story basically says "not so fast." He relates the work of two veteran materials scientists, Yun Chung and Lisa K. Thomas, who have analyzed and critiqued official reports on the broken rods and suggest that Caltrans might have a much bigger problem on its hands than a few dozen broken pieces of steel. Chung, 81, is retired, but once worked for engineering firm Bechtel; Thomas works for Berkeley Research Co.
Their unsolicited peer-reviewed report, which the two engineers completed in October, has gained traction among eminent engineers and a key elected official, and has begun to garner attention from bridge authorities. The often-scathing critique disputes official assurances about the reliability of hundreds of high-strength steel rods that support the new San Francisco-Oakland Bay Bridge. The two engineers challenged basic assumptions about why 32 rods that secured seismic gear on the eastern pier of the new suspension span broke in March. “It means that their failures can bring down the entire (suspension) bridge,” they said. Piller hastens to add that the engineers aren't saying the bridge is going to collapse. What they are saying, though, is that Caltrans needs to take the possibility that steel rods in parts of the bridge need more testing and better protection. Piller says that other engineers agree with key parts of the critique and that the independent document will be part of a legislative review of problems with the bridge construction led by state Sen. Mark DeSaulnier.